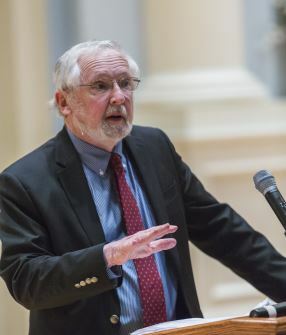 Christians should be “gracious reconcilers.” And, as “principled pluralists,” they should recognize that Christians constitute one minority among others in society, historian and author George Marsden said at Samford University Wednesday, April 1. “Rather than simply looking to protect our own interests, we should be seen as those who, on the basis of our Christian commitments, are truly working for liberty and justice for all,” said Marsden, professor emeritus of history at the University of Notre Dame. Marsden, a specialist on American Christian culture with a focus on evangelicalism and higher education, spoke as this year’s Andrew Gerow Hodges Lecturer in Ethics and Leadership. The event is sponsored by Samford’s Mann Center for Ethics and Leadership. He based his remarks on his latest book, Twilight of the American Enlightenment: The 1950s and the Crisis in Liberal Belief, which recounts mainstream popular cultural outlooks of the post-World War II era. Marsden walked his Samford audience through periods of American cultural and religious history, such as the 1950s, which with its family values, prosperity and plentiful public and private religion “made sense” to many Americans. A weakening of the Protestant establishment was evident in the 1960s and 1970s, when many people recognized diversity in American public life, but few included religion in that principle. The late 1970s, Marsden noted, brought the emergence of the religious right with its demands to put Christianity back into the mainstream of American public life. “It was more like they were asking to return the public religion of America to the 1800s, except they were willing to include conservative Catholics and Mormons in their political coalitions,” he said of the Moral Majority. Marsden said that while the United States has a strong tradition of freedom of religion and religious tolerance, it does not have a clear tradition of promoting religious pluralism as a principle. “When Protestantism fades as the dominant religion, as it has in most of the country, we are left with no strong tradition of protecting religious minorities. That’s the problem,” he said. His solution, as outlined in his book, is based on a set of ideals known as “principled pluralism,” drawn from 19th century Dutch theologian and educator Abraham Kuyper, a Protestant opponent of both state religion and secular liberalism. Based on Kuyper’s thinking, the government should allow any responsible group to have its own schools, all equally supported by taxes, whether religious or secular, but, through the principle of “sphere sovereignty,” the government should recognize the limits of its sphere. “We conservative Christians should be speaking graciously as reconcilers-as one minority voice among many. Our goal should be the equitable treatment of as many legitimate sub-groups in society as possible,” said Marsden. The case for a more inclusive pluralism as a matter of principle is a matter of justice, he said. “Religious communities should not be discriminated against just because of the peculiarity of their religious views.” And, he said, because such principles are consistent with the Constitutional heritage of religious liberty. “Yet, in the current mainstream culture, there is a pushback by those who would like uniform standards that would fail to take into account the value of religious diversity as a matter of principle,” said Marsden. There is also a pragmatic argument that religious communities have contributed tremendously to the health of the nation, such as serving as training grounds for morally responsible public-spirited citizens. And while religion is a major source of conflict, in the past and today, the best way to defuse conflict is to be as open and tolerant of difference possible. That openness is a first step toward encouraging dialogue and fostering understanding, he said. The audience included Samford faculty, staff, students and family members of the late Gerow Hodges, for whom the lecture series is named. Hodges, a Samford graduate, was a Birmingham insurance company executive who served many years on the Samford board of trustees. Rachel Fox, a junior majoring in social entrepreneurship and sociology, said she appreciated Marsden’s remarks.